If you’re a regular reader, you’ll know my last Crow Report was not a happy one. One of the local murder was found dead in the neighbor’s yards. (Details Here: When Death Comes Cawing). I was devastated by the death and even more so when the rest of the birds did not come back for weeks, then months. I am happy to report that on New Year’s Eve, three of the five returned! The tears flowed again but this time they were filled of utter joy instead of heartbreak! They didn’t stay long, but there they were, sitting in the pine tree and strutting around in the yard. They’ve come and gone over the past few weeks, each time making a bit more noise and staying a little longer to enjoy the peanuts and cat food. After a big storm that hit Saturday night and dumped a foot of snow in the area, tossing their food into the yard was rather pointless. The offerings immediately vanished. I decided to try something new. I had two wide planks of wood about a foot wide and 3-4 feet long just sitting around doing nothing by the kitchen porch. Using those, I made a small platform by laying them diagonally between the two railings. Not the biggest landing spot, but better than having to waddle and dig around in the snow, I figured. It only took a few minutes for the Blue Jays to make good use to it, but Blue Jays are not Crows and without a doubt, I could probably stand out there and the Jays wouldn’t care in the least. 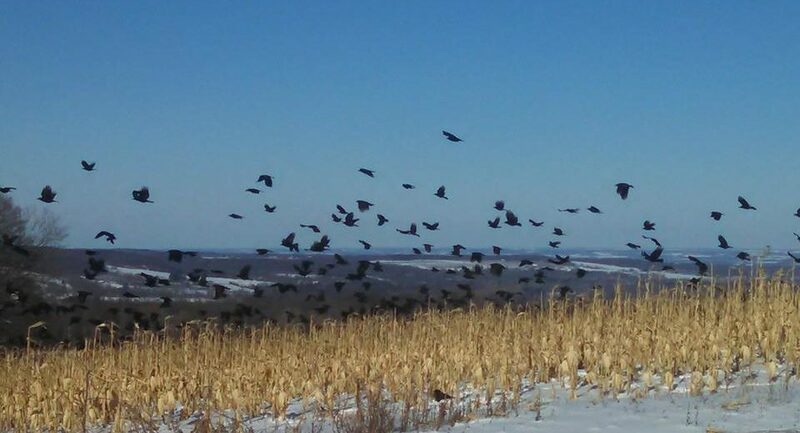 The Crows – well, they aren’t so sure about the whole thing. None of them took advantage of the new configuration Sunday. Monday was a different story. I saved a few pieces of raw bacon from our Sunday morning breakfast along with some boiled Cornish Game Hen giblets – necks, livers, gizzards, etc. That along with the normal peanuts and kibble made for quite the spread. Of course, the Jays came first, nabbing all the peanuts in no time. A Starling showed interest in the kibble, but didn’t linger. Then – quiet. Until about 3:30 when I heard the caw-caw-caw. I dared to peek out. There they were, SEVEN of them, in the trees, eyeballing the platform. One flew down to a nearby stump, tipping his head this way and that, taking in the situation. He fluttered over a bit closer on the ground, pushing snow with his tummy then flew up, did a quick survey and headed back to the tree post haste. Others flew in, doing the same. None of them seemed too keen on landing just yet. But, it was clear they knew there was food up there. Finally, one of them took the dare and landed, grabbed something and was gone just as fast. There was a lot of crow debating after that. More fluttered in, but none landed. This all took place over the span of about half an hour. They all flew off shortly after. It was just starting to get dark so I’m sure they were headed for their roost for the night. As I won’t be home today, I won’t be able to spy on them when they come by at the usual times. I will be able to see if anything is gone when I get back, though. And you better believe I’ll be checking the platform for tell-tale Crow footprints in the snow.